When the Forth Road Bridge was opened in autumn 1964, it greatly improved the road links between Fife and the North East and Edinburgh and the South. It was no longer necessary to loop down to the Kincardine Bridge, a detour of about thirty miles, nor to sit for some time awaiting the ferry that shuttled across the Forth between South and North Queensferry. The new bridge opened up a number of commercial opportunities. Johnnie Hoskins shrewdly agreed a deal with Cowdenbeath Football Club to stage speedway at their Central Park stadium in 1965. The Provincial League and the National League had resolved their bitter dispute, thanks to the Lord Shawcross enquiry and both leagues would amalgamate to form the new British League for the 1965 season. Hoskins not only applied for a licence for Cowdenbeath but also requested to join the newly formed league. With his trademark bluster, he said he was prepared to bring riders from Poland and Russia, if British riders weren’t available to ride for his new team. All good stuff but really pie in the sky! National League promoters, seeking to prop up their ailing league, would have recruited Polish or Russian riders in 1964, if it was at all possible. However the political situation between the west and the east meant that this was never going to be possible. Undaunted, attempts were being made to lure Eric Boocock and Dave Younghusband to Scotland. Both rode for Middlesboro in 1964, but were trackless after the Bears closed in August 1964. It was one of the worst kept secrets that promoter Reg Fearman was looking to open Halifax and would take the duo with him. Despite this, reports in the Speedway Star, suggested that Boocock, after four seasons at the tight Middlesboro track, was looking to ride for a more full throttle track to help develop his career. Edinburgh seemed to fit the bill – I wonder where he got this idea! Strangely he was quoted as saying he would consider either Cowdenbeath or Edinburgh, but not Glasgow, due to the travelling from his Wakefield home – work that one out if you can! 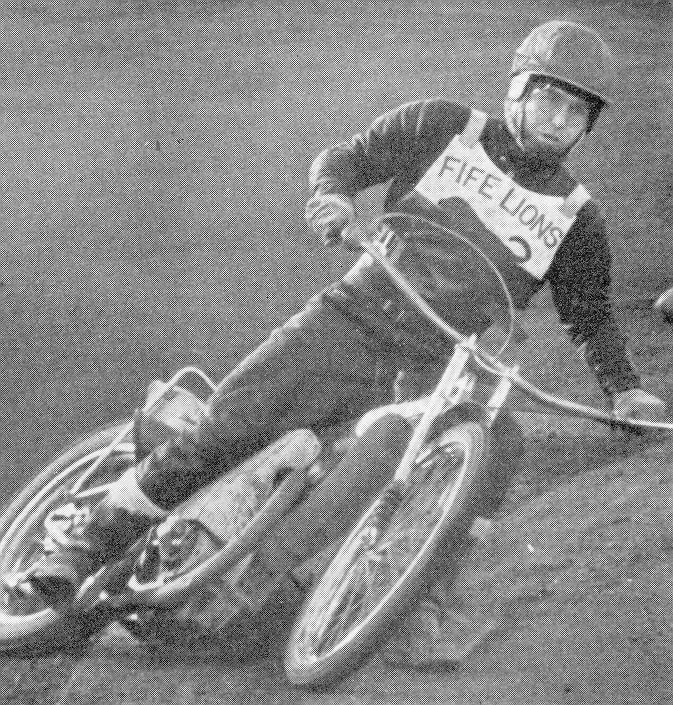 Edinburgh had released Willie Templeton to Glasgow, where the White City track seemed to suit his style, and the Tigers in turn were likely to allow Ray Cresp, a Trevor Redmond asset, to link up with Fearman’s Long Eaton. Perhaps Hoskins expected the circle to be completed by Fearman sending either Boocock or Younghusband north. It was all interesting speculation during a very eventful close season. As expected, full league membership was just a pipe dream but Cowdenbeath were granted an open licence. They were classed as a “development track”, along with Kings Lynn and Gloucester. This meant they had no restrictions on the riders they could book for their meetings. This was quite a big deal. Other tracks, such as Rayleigh, Ipswich, Middlesboro, Rye House and Sunderland were only given the standard open licence, which restricted them to juniors and British League second strings. Fearman opened Halifax, a big fast track, incidentally, and both Boocock and Younghusband would be their spearhead for a number of years. Long Eaton signed Cresp and sent Wishaw based Bluey Scott to Glasgow in exchange. Tigers retained Willie Templeton, thought by some to only be on a one season loan. A number of names were considered for the Cowdenbeath team – Fife Flyers, after the Kirkcaldy ice hockey team, Fife Falcons, Cowdenbeath Bison and Cowdenbeath Bruins among others. Ultimately Fife Lions was the chosen moniker. The track, the most northern in the country, would be about 380 yards and, fitting around a football pitch, would resemble Old Meadowbank in shape. Racing would commence in early May when the light nights would avoid the need for floodlighting. Willie Templeton would be their number one and captain, and, being a Fifer, it was hoped would draw in a local following. No mention was made of either brother Doug or George Hunter being considered for the Lions. Perhaps Edinburgh fans were already unhappy about Willie Templeton going to their arch rivals in Glasgow and the possibility of more defections may have affected their gates. The Lions signed Ross Nickisson and Kevin Russell, a couple of young Aussies recommended by Chum Taylor. It was hoped that a season’s experience would help them develop to league standard in time for 1966. The rest of the team would rely on Scottish juniors. There was quite an extensive list, showing how buoyant the Scottish scene was at the time. 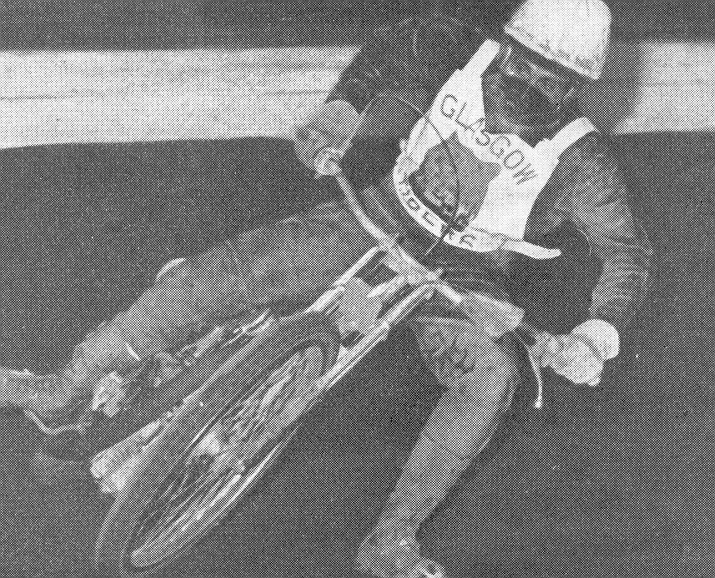 The Glasgow second halves in April featured Bill McMillan, Red Monteith, Eric Hanlin, Joe Hicks, Leo Ramm and Dave Gifford, although the latter had decanted to Newcastle. 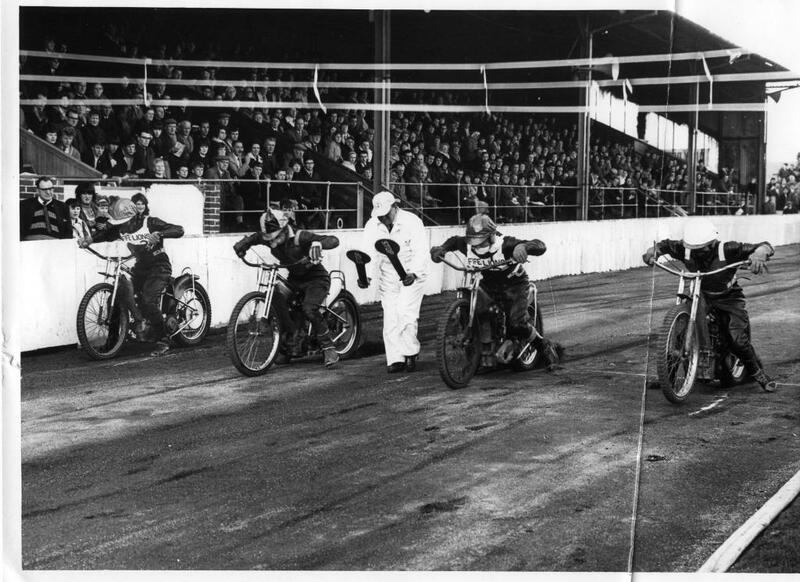 At Edinburgh, the team line up was a bit more fluid, with no fewer than ten riders being on the Monarchs books – Doug Templeton, George Hunter, Henry Harrfeldt, Colin McKee, Wayne Briggs, Bill Landels, Alf Wells, Jimmy Tannock, Bert Harkins and Kevin Torpie. While Briggs and Wells had doubts over their immediate fitness, there were obviously two that could be considered as possible Lions in the longer term. So far so good. The program,priced nine pence (4p), looked to be from the same printers as the Glasgow one and featured the same red, blue and white sections on the cover. Unlike other previous Scottish programs, it did not feature a photo on the cover, instead showing a shot of the previous season’s GB v Russia test in an unusual silhouette presentation. The riders were thought to be Brian Brett, Igor Plechanov and Nigel Boocock. As a local remarked “that was as close as Cowdenbeath got to a Russian! !” The back page, however, does contain a photo or two, all have previously been featured in a Glasgow program. The opening fixtures were to feature meetings against Glasgow, Newcastle, Halifax – so obviously Reg Fearman held no grudges for the winter shenanigans! – and Belle Vue. Interestingly Edinburgh weren’t considered as possible opponents. At Central Park the terracing was uncovered, but it had a large stand, which ran almost the length of the home straight. Admission prices would be 3 shillings, (children 2 shillings), with transfers to the wing stands a further 2 shillings (adults) and 1 shilling (children). Transfers to the centre stand, which was limited, were a further shilling for adults and sixpence for children. Promotions usually go to some length to ensure that the home teams wins its in augural challenge match. Tonight’s Lions were helped by the late arrival of Tigers Manchester based duo of Coombes and Ovenden, both of whom missed their first two rides, with Hicks and Hanlin filling in. The Lions side was composed solely of Scottish riders while the tigers were all ANZACs. · later on we might have to recruit a Russian or a Pole – he doesn’t give up does he? · We shall use guest riders to bring our team up to full strength but, as our riders develop, will use fewer guests. From the Lions viewpoint, a good score from captain Willie Templeton and promising debuts from Nickisson and Russell. Doug Templeton and George Hunter have a match race track record attempts at the interval. The former sets up a rolling start time of 67.4. With the track now cutting up, their match race with the traditional clutch start cannot better the 70.4 set by Bluey Scott in heat one. The fixture list now shows Sheffield, rather than Belle Vue on the listings, while Charlie Monk is billed to be racing Brian Brett in an All Start Match race. With Charlie Monk racing Barry Briggs in the Golden Helmet match race at Poole, Brian Brett is freed from the onerous journey north – he usually travels by train for his home meetings at Newcastle. The Diamond’s other “Brian”, Craven is programmed by doesn’t appear, with veteran Jack Winstanley being called up to make up the numbers. No reason for Craven’s absence is given at the time or in the press but as he rides in Newcastle’s next meeting, it seems unlikely that he was injured. Scott, Templeton and Landels are the top men for Lions, while Russ Dent makes a sensational Cowdenbeath debut and only a fall deprives him of a five ride maximum. The attendance is reported to be around 2,500, which seems pretty healthy but the following week’s program shows that the Adult Ground admission will be raised from three to four shillings. However to compensate, there will be no charge for a transfer to the wing stands. Maybe a case of what might have been, as Boocock and Younghusband arrive at Central Park. With two top line heat leaders – veteran Boothroyd is excused attendance – Lions are going to be up against it and recruit Henry Harrfeldt in place of Torpie. Sadly the Norwegian has a troubled night and pulls out after scoring just one point from three starts. The two point margin of the defeat belies the fact that Lions were well behind throughout and that only tactical rides by Scott and Templeton keep the scores close. Both Scot and Boocock record 70.0 in the first two races, shaving 0.4 seconds of the existing track record. Cowdenbeath, Middlesboro and Ipswich, all non league tracks, stage the preliminary rounds which feature number six and sevens. Riders with previous experience around the ‘Beath fare best tonight. Dent (15), Coombes (12), Ovenden (12) and Nickisson (11) are the top scorers. This augurs well for Nickisson who does well in this company ahead of guys like Harkins, Landels, McMillan, Tannock, Torpie and Paulson (Sheffield). Johnnie Hoskins claims that he is a rider for next season’s team. Now the fixture problems start to mount up. Sheffield were originally scheduled to come on Wednesday 2nd June but the Scotland v England test match at Glasgow is rescheduled or that date, meaning that Willie Templeton, Bill McMillan and Bert Harkins would be unavailable. Hoskins is keen to try a Saturday night, and with both Edinburgh and Glasgow riding in England, decides to go with a junior event. It is a tribute to the sport in Scotland that sixteen riders are readily available, although four, Robinson, Butterfield, Caisley and Gifford are affiliated to English tracks. Juniors Omand and Finnigan, as well as reserves Nicoll, Reid and McKenzie are all given a 100 yard start – although in practice it is more than this as they line up at the start of the back straight so they can see the starting gate tapes. All riders get four programmed rides with the top four going into the final. This ensures that, although some races might be rather uncompetitive, the meeting will build to a climax. Bill McMillan wins from Red Monteith, with Nickisson a faller and Russell a non-finisher. Some joy for Lions in that their Aussies show up well. 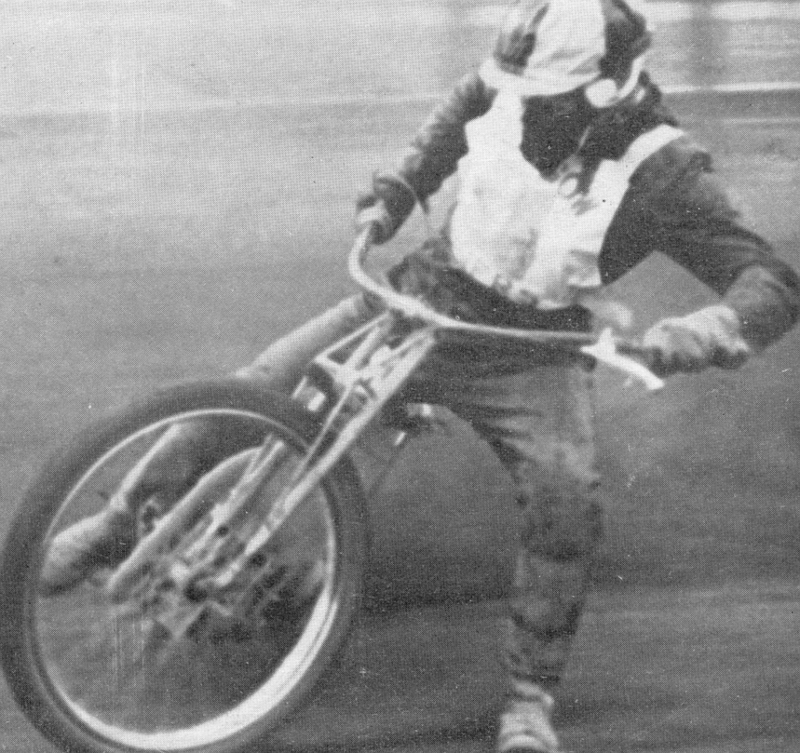 McMillan sets up a new track record of 69.8 in the first heat, suggesting that the work on the track has paid off. .
With Sheffield now reluctant to come north, the next meeting will be Fife Lions versus “The Rest”, with Eric Boocock programmed to line up in Lions colours. At this time, away meetings generally were a bit of a chore for English second strings and reserves. They could usually get to most other English tracks by taking a few hours off work, but a midweek trip to Scotland would mean a full day off on the day of the meeting and probably some time off the next morning. If they only manage a few points then the trip could run at a loss. “despite world championship rounds taking place in the same week when they were fighting for a place in the next round in the road to Wembley” Boocock had his home round at Halifax on the Saturday, but surely the three night gap was sufficient to maintain his machine. If the sides had swapped the riders they had programmed at No2, the meeting would have been Glasgow (Fife) against Edinburgh (the Rest). The meeting is close until the final races when Edinburgh, sorry The Rest!, pull away to win comfortably. The program points out the difficulty of getting English riders to travel north and also says they need about 500 more each week to make things pay. It also shows an increase in the Juvenile admission from two shillings to two shillings and six pence in the advert for the following weeks meeting, which cannot say what the fixture will be– things obviously aren’t too great on a number of fronts. Tonight’s program is a mere four pages, with the editorial on the front page. Still for sixpence it contains all that is required, but it is a further sign that things are not going well in the kingdom of Fife. This fixture was going to be Fife, mainly Edinburgh, versus Glasgow. It would have been interesting to see for which side Willie Templeton would have ridden. However the sides have to be hurriedly revised when Doug Templeton and George Hunter crashed at the Scottish Best pairs in Edinburgh, ruling both out of this meeting and Edinburgh’s World championship round a few days later. In the end Fife raced against “Charlie Monk’s select”. Lions were along their normal lines with Templeton, Scott, Harkins, Landels and Russell in their line up. The program says that “there is a chance of retaining (for next year) a few of your favourites who ride regularly. Strangely, Nickisson, the Lions first, and perhaps only, “discovery” lines up in Monk’s team. Harrfeldt, who had a poor debut at Cowdenbeath, is not selected for either side. Instead Alf Wells, returning from injury, makes his first appearance in Fife, although he fares no better than the hapless Harrfeldt. The crowd, described as “sparse” see the Lions edge out the visitors, for whom Monk is unbeaten and Ovenden gets an impressive seven. For the Lions, Templeton, Landels and Harkins all get double figures while Scott has an unusually quiet night after a second ride fall. By now the crowd numbers are causing some worry, and the lack of new visitors means it is very much “same old, same old” fans who come each week. The Speedway Star report describes the attendance as “sparse”. Floating Edinburgh fans mare probably tempted to head through to Glasgow, who have some attractive meetings in June, for a second weekly dose of speedway action. The program advises fans to check the national papers for details of the following week’s meeting – it will be nearly a month before there is further racing at Cowdenbeath. Despite the fact that Edinburgh’s away meeting at Cradley had been listed for tonight since the fixtures were issued in late March, tonight’s program, again a four page production, listed Torpie, Wells and Doug Templeton in the Lions line up! It would seem that Templeton and Wells were to have a try out following their respective injuries and that Torpie was unlikely to be required by Edinburgh that night. This certainly would have been controversial had it happened. Perhaps wiser counsel prevailed or perhaps neither was fit enough to attempt to ride. Whatever the reason, the program was a mass of changes and is a sad finale to the Lions life and times. Despite having Scott, Monk and Willie Templeton in their colours, Lions make hard work of beating the “Rest of Scotland” for whom only Coombes, Ramm and Tannock manage to win races. Coombes twice heads Monk home, while less impressively Tannock beats Bernie Lagrosse, making his Cowdenbeath debut, and Ramm beats Black in a two finisher race. The racing and the weather are described as “good” but the attendance rates as “not so good”, and this on a prized Saturday night. No further meetings were staged. The Lions seem to have gained local authority agreement to staging Sunday afternoon meetings. I say “seem” as Ian Hoskins got agreement to race junior meetings on Sunday afternoons at Coatbridge in 1969, only for the local MP to take the matter up with the Secretary of State for Scotland. At this protest, the local authority withdrew their consent. Interestingly, the Secretary of State would later reply that, unlike England and Wales, there was no law on Sunday observance in Scotland. The matter was certainly a political hot potato. The Promoters Association rather sidestepped the Lions request by referring the decision to the Scottish ACU. In any case, the promotion decided against further racing at Central Park. The promotion badly under estimated the resistance of English second-string riders to travel to Scotland for midweek open meetings. Their only previous experience of booking riders was generally confined to Provincial League heat leaders invited to ride at Edinburgh on a Saturday night – completely different! Perhaps if they had understood the situation, they might have opted for fortnightly meetings and spread the English visitors (Newcastle and Hlaifax) a bit wider, rather than have them on successive meetings. The detailed history, above, shows how repetitive meetings quickly became. Even then, there was no consistency in the Lions side, with riders riding for them one week then appearing in the opposition the next. The “development” licence was perhaps a mixed blessing, as the standard “open” licence would only have allowed second strings and juniors, and possibly a longer season may have been possible using lesser teams. The promotion, in the last program, reckoned there were enough riders in Scotland to form four teams. The Cowdenbeath track was used throughout the winter and these weekly practice sessions led to the much quicker development of Jim McMillan and Brian Collins than might otherwise have been the case. Each winter in the mid sixties, there was continuing speculation that the Edinburgh Council might refuse to maintain the Old Meadowbank arena ahead of its scheduled demolition to provide a Commonwealth Games venue, required for the 1970 games. Had the council “pulled the plug” at the beginning of 1966, it seems likely that the Monarchs would have moved en masse to Cowdenbeath. While it was good news that the Council had not scheduled demolition before 1968, it meant there was no immediate requirement for the Central Park track, and the speedway lease was allowed to lapse. Almost immediately, stockcar racing moved in to use the track and the venue was lost to speedway. Britain’s most northerly track was no more!